Good morning! I can't believe we're on the second week of February already. It seems like time picks up a lot more momentum the older you get. Cliché I know. But seriously, February. You'll find it hard to believe that I turned this pile of fabrics into a finished quilt but I did. Here's the proof. It's bound even, not a just a top, not unbound, DONE. At the onset of the project I couldn't quite imagine how I could turn a modern looking quilt into something that was PamKitty style, but reducing the blocks by half did the trick. 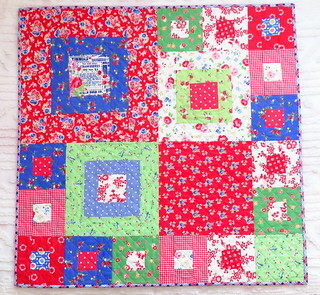 So there you have it, My American Patchwork and Quilting quilt along quilt. I am happy it's done and I'll pop it on the table once I clear it off. Go ahead, insert some maniacal laughter here. A clean table. I crack myself up. Beautiful. You are so talented. And who has a clean table not us quilters. Gorgeous.....it looks so fresh, pretty and modern. Such a quick finish too. Would love a clean and tidy table myself!! Clever you! and managing the math I am so i impressed. That's quick! And beautiful! There is a shortage of clean tables around here too. Maybe you can post a tutorial when you do yours. Yay, to a beautiful finish! Clean Table? Someone once said, "Empty desk, empty mind" - so keep it 'busy' :)! I've been trying to clean my table off for three weeks, LOL! I love your table topper! 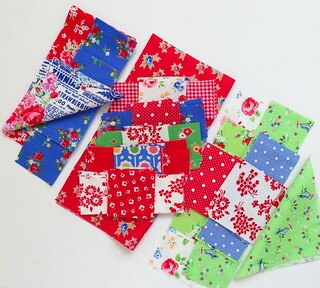 I amazed at how different fabric makes me love a quilt and inspires me to check out a pattern. I love PamKitty style...it makes a modern looking quilt cozy.